Historically inspired children’s books shine, I think, when they don’t try to take on too much of an era or answer all questions because they can spark an interest in further investigation on the part of the reader. 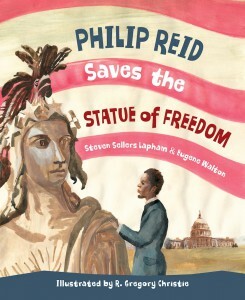 Philip Reid Saves the Statue of Freedom excels at using the picture book medium to draw a reader in. When I read the book to my 5-year-old daughter she asked to have me read it again. She wanted to look at the cover and have me read the afterword. Then we got online and looked up photos of the titular Statue of Freedom. At this point her attention shifted but I found myself reading more (on Wikipedia) even without her prompting me on. The book at first seems to start abruptly. We learn that a man learned his trade in Africa and taught a boy born into slavery in the United States what he knew. We quickly see the boy sold away from his family and apprenticed in a foundry in the Northern United States, where his path would lead him to being an integral part in the story of a bronze statue that still sits atop the United States Capitol Building today. For the reader, we are not surprised that Philip has the skill of a craftsman that serves him when disassembling a mold of the statue for transport and casting as depicted in this story, but the denouement is in the Epilogue where we learn Philip Reid was emancipated in Washington, D.C. before the final piece of the bronze statue was placed atop the Capitol Building. Beautifully illustrated and all around well done. Ages 5 and up. The publisher, Sleeping Bear Press, provided a free copy of the book for my review. I love stories that make history accessible and interesting, even to small children. One to add to my classroom collection.